EverBold® ink system delivers consistently bold marks. Writes smoothly on whiteboards, glass and other nonporous surfaces. 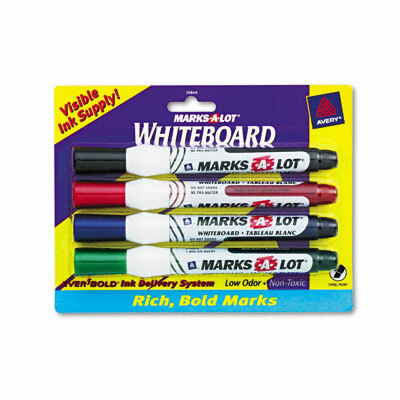 Unique easy-to-grip slim barrel designed specifically for marking on vertical surfaces. Durable 1/4" chisel tip marks in a variety of line widths. Low-odor and nontoxic; ACMI certified (conforms to ASTM D-4236). EverBold® ink system delivers consistently bold marks. Writes smoothly on whiteboards, glass and other nonporous surfaces. Unique easy-to-grip slim barrel designed specifically for marking on vertical surfaces. Durable 1/4" chisel tip marks in a variety of line widths. Wipes off easily with a dry cloth or eraser. Visible ink supply window. Low-odor and nontoxic; ACMI certified (conforms to ASTM D-4236).